A transit advocacy group is calling on the city to forge ahead with the bus lanes, bike paths and other mitigation efforts that were planned for Williamsburg and Manhattan as part of the prior L-train shutdown plan that was abruptly called off last month. Transportation Alternatives will be hosting a rally on Feb. 6 to demand that Mayor Bill de Blasio commit to “the best versions” of plans outlined months ago for Grand Street in Brooklyn and 14th Street in Manhattan despite the change in the L train’s construction. The rally, which will take place outside the 1st Avenue L subway station, will start at 10 a.m. and last for one hour. 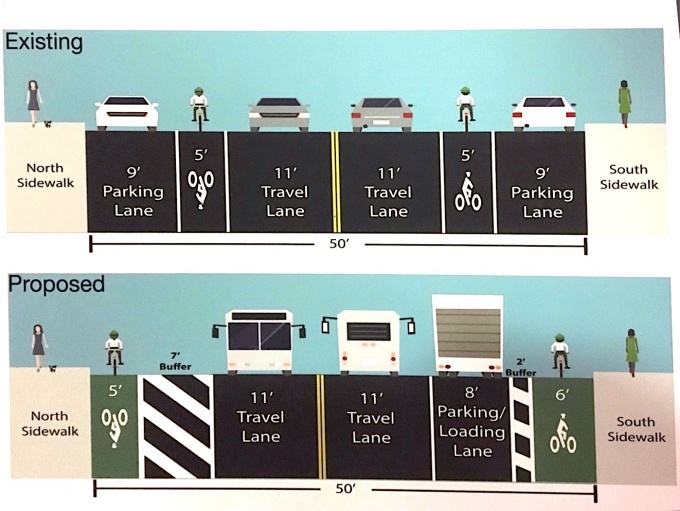 As part of the MTA’s mitigation plan for the initial L train shutdown, protected bike lanes, buffers, and parking lane changes were to be implemented along 10 blocks on Grand Street to allow for smoother trips for commuters, especially those traveling by bike and bus. The changes were also expected to accommodate for the two L-Alternative bus shuttle routes planned to travel through Grand Street, with one of them connecting to Manhattan’s 14th Street, itself once slated to see massive changes to the roadway that included bus-only hours and bike lanes. Work had already begun on the Grand Street bike lanes late last year when Governor Andrew Cuomo announced weeks ago that the shut down was no longer necessary, thanks to an innovative construction plan drafted by a new team of engineers. With Grand Street bike lane work seemingly partially finished, and at a standstill since Cuomo’s announcement, cyclists claim they have been left with dangerous biking conditions and no enforcement for cars parked in the bike lane. Several cyclists, commuters and area residents attended a Brooklyn Community Board 1 Transportation Committee meeting on Jan. 28 to share their frustrations and stories of injuries caused by the unfinished rollout. One attendee, Kyle Yakal-Kremski, claimed an accident caused by an uneven utility cover landed him in a neck brace, according to Streetsblog. Calls for an improved and full plan for Grand Street and other mitigation service areas have also been lodged by local officials, many who say that the city shouldn’t wait for an L-shutdown-like closure to implement changes like bus and bike lanes. And with minimum wait times of 20 minutes between L trains at nights and on weekends during the upcoming construction under the new plan, many say there’s no reason for mitigation plans to be left off the table. While the MTA and DOT have not yet announced what mitigation plans, if any, will remain in effect or be improved on under the new L train plan, an internal memo obtained by Streetsblog last month painted a worrying picture. The memo suggests that the First and Third avenue stations could become exit-only, while there would be no new inter-borough bus routes, no new bus routes in Brooklyn or along 14th Street, and no additional ferry service. Overnight, there would be no additional L shuttle service, no increased G train service and possible restricted access to L train platforms if overcrowding occurs. MTA responded to the reports by saying that the plans are still in the draft stages.